Sometimes it helps when you let someone else do the driving for you. When you need a ride to an event or other affair, request our taxi service and we'll you drop you off to your destination in no time at all. 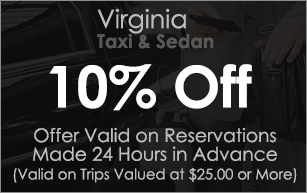 Those who enjoy the finer things in life will appreciate Virginia Taxi & Sedan's luxury sedan service. We chauffeur clients in our impeccably clean, premium-grade sedans, offering plenty of space to get comfortable as we take you to your destination. Contact us to find out more about our duct cleaning and vent cleaning services.